We believe the best way to remove debris from gutters is by hand. Our workers go up with a bucket and remove all debris by hand. All clogged downspouts are then taken apart, cleaned, and reattached. We do not use water for many reasons but the most obvious is water does not eliminate the clog, it only moves it. We do not use leaf blowers either as this also does not insure downspouts working properly, and frankly makes a huge mess. We use an environmentally safe cleaning solution that does not harm flowers, foliage or bushes. We start by spraying on the solution, allowing it to do its job, then rinsing it off with a high power pressure washer. We also powerwash concrete porches, walkways and around pools. We only install high quality seamless aluminum gutters. We don't use typical spike and ferrel installations, instead we use hidden screw hangers that hold the gutter in place better and are much more secure. We have 20 different colors to choose from which allows us to match the exterior of your house perfectly. We do offer exterior window cleaning on a limited basis. We understand that some windows are to high to clean. or difficult to get to. Just ask us if we can clean a specific window and if its accessible our guys will take care of it for you. The cost is $4 per window and some windows we cannot do. We do not stock the equipment needed to do some windows but the guys can let you know that when they arrive. This service is one that i choose not to do on a regular basis. Reason for this is that most gutter guards DO NOT work the way you think they should. Most will keep out large leaves and sticks. However pine needles, nuts and small leaves can and will get in and clog the gutter. Also if you want the mesh type guards, they do keep the leaves out of the gutter, but not from sitting on top of the guard which stops the water from getting in the gutter. If you are interested in this service please ask us when you call. Most times it is not cost effective to install these type systems, as they cause more problems. 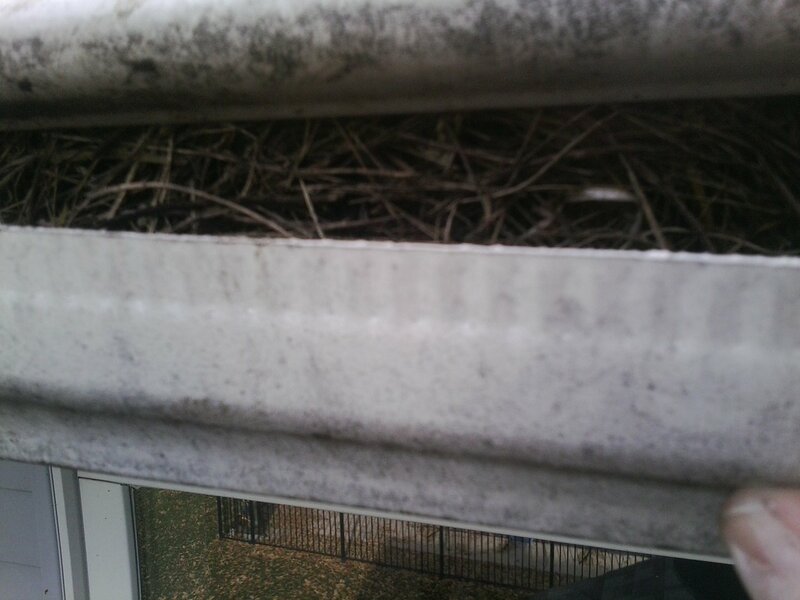 The birds and the bees love gutter guards as they make great roofs for there homes. This is a picture of how well the GutterPro one piece gutter guard keeps gutters cleaned. These were installed on a house for $4,500. If you have a traditional skylight that is out and would like us to install a new one let us know. The cost is $15 for each light replaced which includes the light and labor. This is done on a per job basis and not every request can be honored. This is mainly due to insurance reasons as we are not insured as tree trimmers. We can trim trees that are over hanging your home as long as they are able to be cut from the roof. This service usually runs between $50-$100 depending on what needs to be cut back. It is also up to the discretion of the guys on the jobsite and if they feel its safe or not.